Official images show the upcoming sub-4 metre SUV in all its glory. To be unveiled at the New York International Motor Show alongside its India reveal on April 17. Set to become the country’s first connected SUV with an eSIM. Official images confirm design and styling cues seen earlier. To come with two petrol and one diesel engine option in India. Likely to hit showrooms in India by May 2019. Hyundai is all set for the global unveiling of its first ever sub-4 metre SUV, the Venue, on April 17. 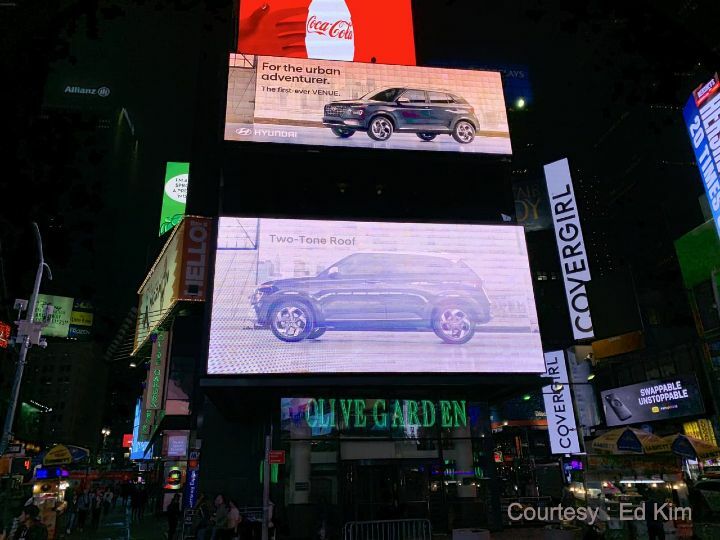 While in India we are all eagerly awaiting its arrival, the baby Creta (as it’s being called) is hogging all the limelight on the Billboards at Times Square in New York. Yes, the upcoming Venue has been spotted in all its glory in official adverts that were screened at the famous tourist hot spot in Midtown Manhattan. With its global unveil set to take place alongside the India reveal on Wednesday, the Venue marks Hyundai’s entry into the hotly contested sub-4 metre SUV segment in India. And in the latest images, we get our best view yet of the upcoming SUV. The production version, seen in the billboard adverts, confirms most of the design elements spotted on the India-spec version a few days ago. It gets Hyundai’s all-new cascading grille with chrome mesh design and 17-inch dual-tone alloy wheels that sit flush in chunky wheel arches. Like the India-spec SUV, the global variant also comes with roof rails to enhance the overall sportiness of the SUV. What’s also visible is the dual-tone paint-scheme, which gives the Venue a premium appeal. Like all recent Hyundais, the Venue gets a split bumper embedded headlight assembly with squarish LED DRLs surrounding the headlamps. As seen in the spy shots earlier, a similar theme is also seen at the rear with a boxy tail lamp assembly. However, design isn’t the biggest draw for the latest Hyundai as it is set to be the country’s first ever connected SUV. The Venue will come with a host of embedded tech, including 33 connected car features that can be accessed via an embedded SIM card and a smartphone. Out of these, there are 10 India specific features which you can read about here. Under the bonnet, the Venue is expected to come with a choice of three engine options. These include an all new 1.0-litre turbo petrol motor which churns out 100PS of power. There is also the option of a 1.4-litre petrol motor borrowed from the Verna and another 1.4-litre diesel from its elder sibling, the Creta. While the turbo petrol will get an all-new 7-speed DCT gearbox, the other two engines will have to make do with a 6-speed manual. Expected to priced in the range of Rs 8 lakh to Rs 12 lakh (ex-showroom), Hyundai will take the competition head on, which includes the segment leader Maruti Suzuki Vitara Brezza, Ford EcoSport and the recently launched Mahindra XUV300. While we look forward to the global and India unveiling this week, the new SUV is expected to hit showrooms by May. We will have more details, including variants and detailed pricing soon, so stay tuned. Share your experiences with Venue?